British Columbia’s importance to famed Italian motorcycle maker, Ducati, will be reflected this week as the Bologna-based brand brings their new lineup to the 2019 Vancouver Motorcycle Show. The display at the TRADEX Exhibition Centre in Abbotsford will be the backdrop to Ducati’s most diverse lineup yet, available for the public to experience from Friday, Jan. 18 through Sunday, Jan. 20. 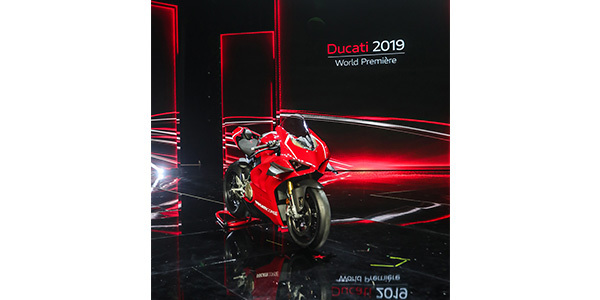 With the exhilarating new 2019 motorcycle offerings, Ducati has a wide breadth of new motorcycles appealing to those seeking exhilaration from the sport. Adventure riders will have the opportunity to explore the all-terrain capable Multistrada 1260 Enduro, while Ducatisti can also check out the first completely new Diavel since its debut in 2010, with a new 1262 cc engine and muscular styling. The Hypermotard 950 also gets a big update with a new look, lighter weight, improved technology and higher horsepower engine. In addition to the exciting new models, Ducati will also have an a selection of the 2019 Ducati apparel collection and Ducati performance accessory selection on-site to complement these different worlds of motorcycling. Diavel 1260 ($22,995 CAD MSRP / Available April 2019) – Unconventional, unique and unmistakable, the second-generation Diavel 1260 remains faithful to the original spirit of this incredibly special bike, drawing on its key styling elements and putting a decidedly more contemporary slant on it. Its Testastretta DVT 1262 engine is capable of delivering 159 horsepower at 9,500 rpm. The bike also includes an upgraded chassis to make it more responsive on mixed-road routes. The S version on display also features fully adjustable Öhlins suspension, dedicated wheels and an even higher-performance braking system, with Ducati Quick Shift up and down Evo (DQS) as standard to allow clutchless shifting. Hypermotard 950 ($15,295 CAD MSRP / Available February 2019) – With new sharper angles and a lighter weight, the adrenaline-packed Hypermotard takes its look from the supermotard race world and for 2019 comes with completely overhauled ergonomics and an ultra-advanced chassis set-up and electronics package. A full 8 lbs. lighter than the previous model, the Hypermotard mounts a renewed 937 cc Testastretta 11° engine with a more muscular 114 hp. Scrambler Café Racer ($13,295 CAD MSRP / Available February 2019) – The new 2019 Scrambler Café Racer draws its inspiration, and its Silver Ice Matte graphics with blue frame, from the legendary Ducati 125GP Desmo. The new 17 in. spoked wheels and aluminum bar-end mirrors give the bike a cool 1960s race look, while a modern radial front brake pump provides braking performance on a par with that of a sport bike. It’s a rare Ducati in blue – one surely to catch the eyes of everyone on the streets.